Lush Rub Rub Rub - This is an old favourite and I think about my third tub?! It exfoliates really well but doesn't irritate my sensitive skin and leaves behind a really nice scent. It's been perfect the past week or two as the weather's been so nice I've been outside in the garden a lot barefoot. Therefore my feet get quite dirty and dry. Soap & Glory Daily Smooth Body Butter - Since I'm walking around barefoot a lot my feet get really dry so I've been applying this each night and then wearing some socks for a treatment and it's been working wonders. I'll wake up in the morning and my feet are so soft and smooth. 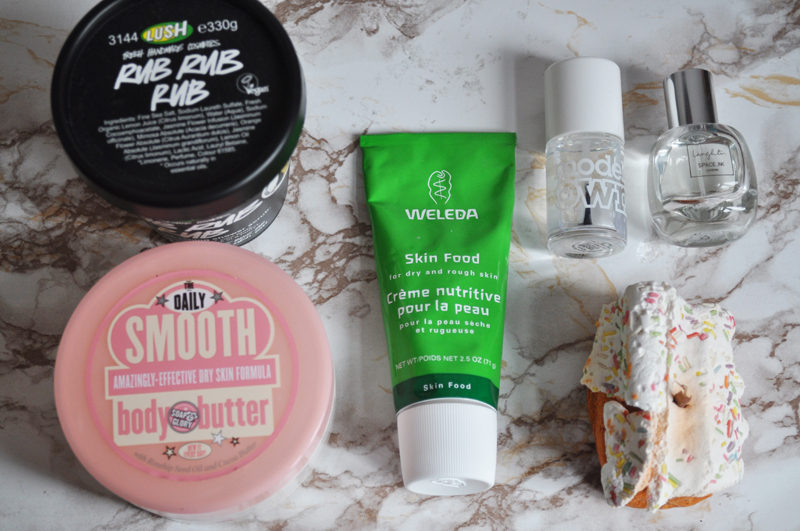 Weleda Skin Food* - I said in my last monthly favourites that my skin had been really dry and still has been this month. Each morning I've been using this as my day time moisturiser and it really helps to get rid of any flaky areas. As this is a really thick balm, I wouldn't recommend this for anyone with oily skin. But those with dry skin should really give this a go. Models Own 3 in 1 base coat, topcoat & gloss - I really didn't get on with this when I first bought it as it created bubbles despite how thin I applied it. Since I'm trying to save my mini bottle of Orly topcoat I've been using this instead and I've really been liking it. Somehow, not using it for a few months has changed it. I haven't noticed any bubbles in my manicure and it's made my polish last longer. Space NK Laughter Perfume - I'm trying not to use it as it's quite an expensive one but it smells SO good and I've been wearing it a lot this month. It's such a hard scent to describe so definintely go and have a smell in Space NK. Lush Gingerbread Bubble Bar - This is probably one of my favourites from Lush and wish they'd make it permanent. Or at least bring it back every Christmas. It has a really sweet gingerbread scent and makes millions of bubbles with only the smallest amount of bubble bar.